CG Says: The 2019 Mazda MX-5 Miata gets a mid-cycle freshening. Revisions to the 2.0-liter 4-cylinder engine adds 26 horsepower for total of 181 and also increases the redline from 6800 rpm to 7500. The previous tilt steering column has been replaced by a tilt and telescopic unit. Smart City Brake Support (a low-speed automatic emergency braking system) is newly available and a rearview camera is now standard. The Mazda MX-5 Miata is a two-seat sports car available as a roadster or as an RF (for Retractable Fastback) coupe version. The RF has a power-retractable targa top instead of the roadster’s manual cloth top. 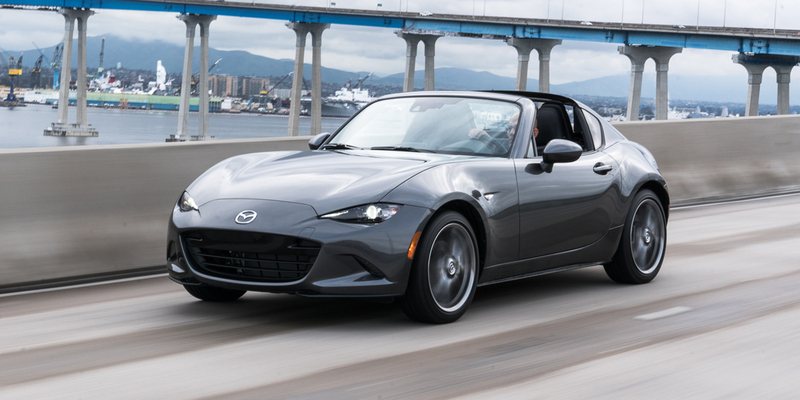 The all-new for 2016 Mazda Miata inaugurated the fourth generation of this iconic car. Highlights of the redesign included more-aggressive styling, aluminum-intensive construction for a lighter curb weight, a touchscreen infotainment system with available navigation, and a manually folding soft top that’s exceptionally easy to operate. Available features include blind-spot alert, rear cross-traffic alert, lane-departure warning, traffic-sign recognition, and automatic high-beam control. The sole engine is a 181-horsepower 2.0-liter 4-cylinder, which can be paired with a 6-speed manual or 6-speed automatic transmission. (The Fiat 124 Spider is based on the MX-5 Miata platform, but wears unique bodywork.) The Mazda MX-5 stays wonderfully true to the Miata’s pure-sports-car spirit while delivering good fuel economy, high levels of all-around refinement, and several welcome technology features. However, the inherent Miata compromises—namely a cramped cockpit and tiny trunk—are there as well. Even though base prices have crept upward, Miata still represents an excellent value in its class. For pure open-air driving fun at an affordable price, it’s pretty much in a class all its own.